I have a five year old Pomeranian mix (25lbs). 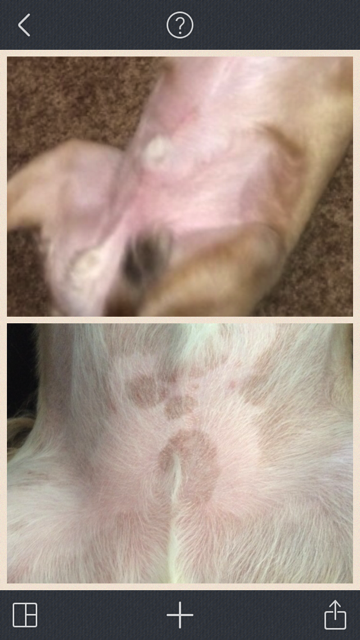 Within the last few weeks I have noticed dark brown colored spots on his belly and near his legs. Before then his stomach was completely pink. He is acting completely normal and isn't scratching or licking the area. I have also emailed you a picture as well. These brown spots really do look like normal areas of pigmentation or in other words, large freckles. It's hard to say why they weren't noticed before. But, I think that it's extremely unlikely that they are anything to worry about. I don't think it is connected to his food or environment in any way. Now, if for some reason these spots become itchy or bothersome in any way then I'd have them checked, but this really looks like nothing to worry about. Of course though, I can't give you a complete diagnosis over the internet. The next time he is in at the vet's I'd have them take a look but I will be very surprised if these are ever an issue! Thank you for getting back to me. So it's not uncommon that these freckles can appear after 5 years of not having any? I can't say that I can ever recall a dog having freckles suddenly appear at 5 years of age. But, really, I can't see these being anything else!